BlackBerry introduced two very different smartphones at Mobile World Congress in Barcelona. One phone, Q20 is a keyboard-equipped flagship device that’s a callback to the classic BlackBerry form factor, and the other phone, Z3 is a sleek touchscreen phone made specifically for the Indonesia market. 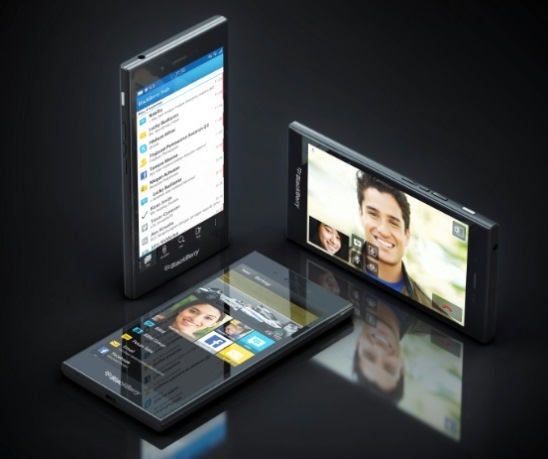 The BlackBerry Z3 is a full-touch smartphone with a 5" qHD display and runs BlackBerry OS 10.2.1. BlackBerry CEO John Chen says that this is the first phone to come up with the strategic partnership with Foxconn. The phone is powered by a 1.2GHz dual-core Snapdragon 400 chipset and 1.5GB of RAM. Internal storage is 8GB, but there's no information if there's a microSD card slot available. At the back, there's a 5MP camera, while at the front there's a 1.1MP one. Music lovers would also like the fact that the Z3 features an FM Radio, too. The phone will hit Indonesia in April and will cost less than $200 off contract. As for the BlackBerry Q20, the company has gone back to its roots and the phone features a physical QWERTY keyboard and a trackpad. It seems, the BlackBerry wants to attract some of its core fans back and offers them a phone they'll be productive with. The Menu, Back, Send and End buttons and the trackpad will be made an integral part of the device and user interface and in conjunction with the 3.5" display, BlackBerry says the phone will offer the best email experience on the market. The company also states that the Q20 will be made of premium materials, which will result in reliability and durability, but doesn't specify which ones. BlackBerry says the phone will launch in the second half of the year, and more details will be revealed at that time. BlackBerry is yet to confirm all the specs officially. We hope they don’t take much time to do that. BlackBerry also announced BBM for Windows Phone and Nokia X platforms. BBM is the company’s mobile messaging platform that has seen a sharp resurgence in popularity since BlackBerry released iOS and Android apps last year.